A ribbon-shaped band of nerve fibers or muscle. 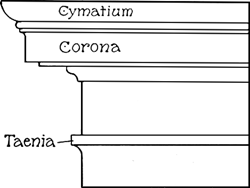 A narrow raised band or fillet, particularly the topmost member of the Doric architrave. Also see order.